The Dodge Durango has managed to push what it means to be an SUV beyond the boundaries that were created. Not only is the Durango the perfect family vehicle, but it combines the well-known power of Dodge, and creates an SUV that can haul your family around, and still manage to be fun. Your SUV doesn’t have to slow you down, and in the case of the 2019 Durango, this SUV will speed everything up. The latest technology can be found throughout the five model options, and each of those models comes with a powerful engine that will send a roar every time you step on the accelerator. To learn more about the five available models, keep reading down below! There are no weak model options offered with the Durango. Each model, starting with the SXT, comes with a powerful engine and a long list of standard features. The features that come with the SXT include Keyless Enter ‘n Go with Push Button Start, Android Auto and Apple CarPlay, a 7-inch touchscreen, Uconnect 4, a 7-inch full-color driver infotainment display, Voice Command, Bluetooth, driver-oriented electronic T-shifter, and a perforated leather-wrapped sport steering wheel. You can add leather seats for an added luxurious feeling. The engine that powers this model is a Pentastar 3.6-liter V6, which produces 260 lb-ft of torque and 295 horsepower. This system is paired with dual exhaust and an eight-speed automatic transmission. You should be able to tow a best in class 6,200 pounds. Moving up a trim will give you even more standard and available features. 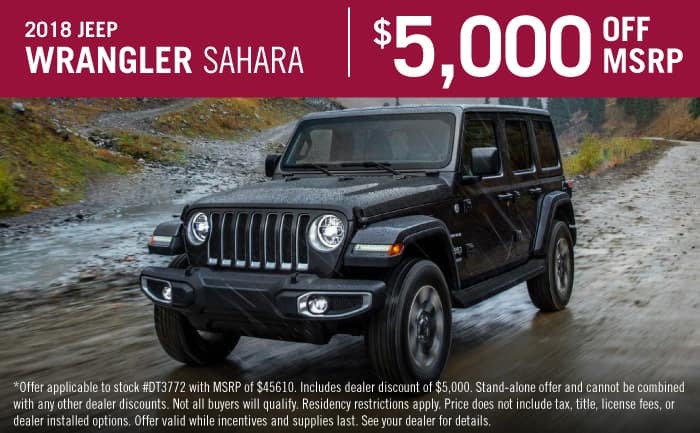 These features include a power liftgate, LED daytime running lamps, paddle shifters, dual exhaust with bright tips, a heated leather-wrapped sport steering wheel, seven-passenger seating, heated 1st and 2nd row seating, and Capri leather-trimmed seats with suede insert. You’ll also find performance features like a performance front fascia, LED fog lights, available hood with center air inlet duct, and available cloth seating and 20-inch wheel design. Right in the middle of the model lineup is the Citadel. This option adds more standard and available features like rain-sensing windshield wipers, second-row captain’s chairs, a premium 9-speaker audio system with subwoofer, a 19-speaker Harman Kardon audio system, Apple CarPlay and Android Auto, 20-inch polished aluminum wheels, navigation, HID headlamps, an 8.4-inch touchscreen, and automatic high-beam headlamps. While it does come standard with the Pentastar engine, you can choose to get the HEMI 5.7-liter V8, which creates 390 lb-ft of torque and 360 horsepower. This engine gives you 7,400 pounds of towing capability. This model pushes the envelope of performance even further, coming standard with the engine that is optional with the Citadel trim. The 5.7-liter HEMI boosts this model to a best-in-class tow rating of around 7,400 pounds. Standard features include Android Auto, performance steering and suspension, Apple CarPlay, performance front fascia with LED fog lamps, navigation, HID headlamps with automatic high-beam headlamps, and an 8.4-inch touchscreen with Uconnect 4C NAV. The final available model, the SRT, swings in with more standard features and an impressive engine. Some of the features you’ll find include Brembo high-performance six-piston and four-piston calipers, a performance-tuned AWD system, rear sway bar, an Active Damping system, high-performance exhaust note, and stiff front and rear springs. Inside the SRT you’ll find a suede-wrapped headliner and A-pillars, Performance Laguna Leather on the instrument panel and door bezels, an SRT flat-bottom performance steering wheel, and premium velour bound floor mats. The standard engine is a 392 HEMI, which outputs 470 lb-ft of torque and 475 horsepower. The towing capacity is bumped up to 8,700 pounds! 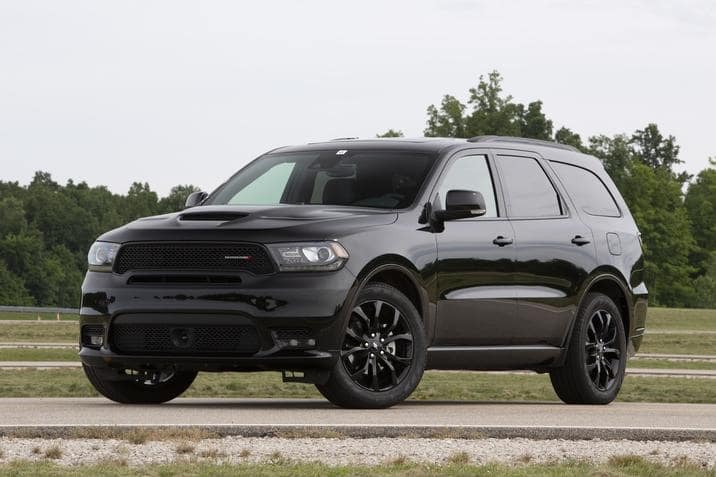 As we wait for the 2019 Dodge Durango to come to dealerships, be sure to check out the rest of our Dodge Durango inventory! You can also direct any further questions to us by giving us a call today!